Three local community workers are set to embark on an epic trek this September, all in the name of two local charities. Donna McCloskey, Sophie Blake-Gallagher and Tina Burke from the TRIAX Neighbourhood Management Team, are set to walk the ‘French Way’ of the Camino de Santiago, in order to raise funds for the Foyle Hospice and the Pink Ladies. Speaking to the ‘Journal,’ Donna said a number of members of the TRIAX team have been personally affected by cancer over the past 18 months and, therefore, they felt it would be fitting to raise money for two local cancer charities. “It’s an issue that affects everybody, but it’s definitely prominent in our organisation,” said Donna. 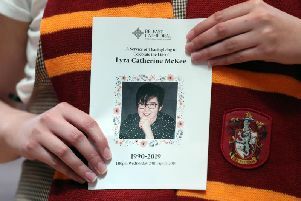 “Over the last two years we have had five or six members of staff who have lost a relative to cancer and I guess it just brought it to the fore. “I have been a volunteer with the Pink Ladies and Pink Panthers for the last 10 years, so I always personally wanted to do something for them and this seemed like the ideal opportunity,” she added. “We put it out to the whole staff team, and it came down to the three of us, so we thought we’d go for it,” she declared. For Sophie, both charities hold a place close to her heart, as she lost her beloved mother, Eileen Blake, to cancer last November. “Personally, mammy passed away in November from cancer and the Foyle Hospice did so much for us as a family. “They helped us out in so many ways and were so supportive throughout her illness so I felt it was only fitting to raise money for them. They were like a lifeline,” said Sophie. Donna added: “There’s not a family in this town - or across the country - that hasn’t been affected by cancer. We’ve all benefitted from the Foyle Hospice and the fantastic work that they do. “The Pink Ladies and Pink Panthers, the support they give, whether it’s a telephone call, a one to one, it’s a listening ear which is important. The trio have paid for their own flights and accomodation ensuring that every penny raised will go directly to both charities. “People relate to the fact that we’ve opted to our own way. That part of it seems to have appealed to people,” claimed Donna. Theladies will take on the 112 kms French Way on September 28. Donna said the walk is very well organised and the days are broken down depending on where you are staying each night. “It’s very well organised, they set you out a certain number of kms each day so you book your hostel in advance. You are really walking hostel to hostel. “Having listened to others whohave done it, it’s all about the camaraderie which is experienced on the walk. Everyone has a story to tell. They talk about why they are doing it and who they’re doing it for. It seems like an all-round good experience to be part of,” continued Donna. Tina recently tore ligaments playing football so is unable to train at the moment, but Sophie and Donna embarked on a 14-miles walk on Sunday to kick off their training for the trek. In terms of fundraising for the charities, the trio have a number of events planned over the coming weeks. The ladies are set to hold three fund-raising coffee mornings. Tina in Creggan, Sophie in Rodden’s Bar in Buncrana and Donna in her local hurling club. They will also host a ‘Big Breakfast’ on September 9 with the Pink Ladies. And number of other fundraising events will be organised in the coming weeks, including bucket collections at the popular Gasyard Feile.